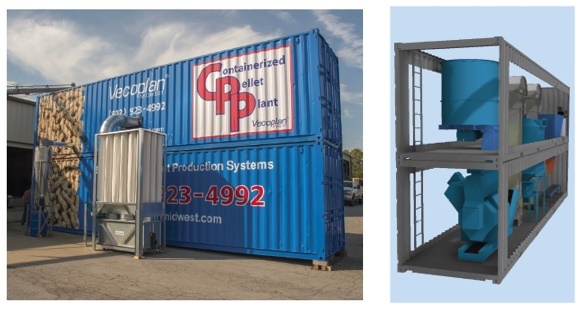 Vecoplan Midwest, LLC has developed an entirely self-contained pellet plant that is compact, clean and affordable featuring 1-2 ton per hour production solution and 4 hour set up time. The Vecoplan Midwest CPP is available standard, with manual weigh scale bagging. Options include: bulk loadout as well as tote sack loading. Additional add on options include large raw material surge capacity, hammer milling, and on site office. The CPP is designed, built and shipped complete with controls from our New Albany, IN location. These units are designed to be shipped on 2 semi trucks. A crane is used to stack the containers. The customer provides a flat 40’ surface, electric feed to the main panel. The CPP can be up and running production within 4 hours. Plus, it adapts easily to most existing trailer loadout systems and alleviates the need for expensive buildings. The Vecoplan Midwest CPP is the perfect pellet plant for processing wood, biomass, feed products, manures, most anything that needs to be pelleted. The plant can be relocated in a very short time, should the need arise. Vecoplan Midwest stands ready to provide after-sales service and parts as well as on site operator training. See our Brochures section for more details.